The exterior of this contemporary home above first caught my attention then the interiors kept it. 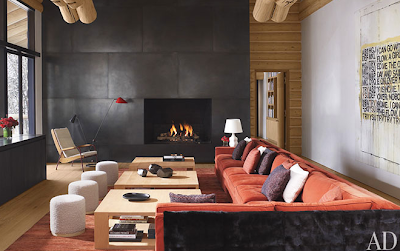 Brushed oak paired with white, rust, and black are the predominant colors in this contemporary mountain home. 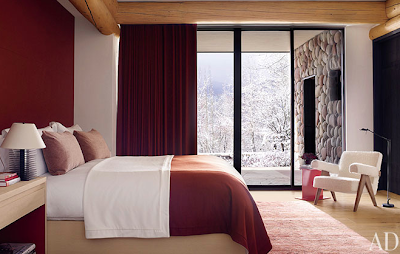 The colors are even continued into bathrooms, bedrooms and the highlighted bunk room. Wire-brushed oak in the media/game room. An elegant and functional look. Seriously look at the views from this shower?! I'm all for quality and great design but using Loro Piana cashmere for the curtains? (In the bunk room above and in this guest room below.) Seriously are they just trying to burn money? I"ll play hide-n-seek in there every night! 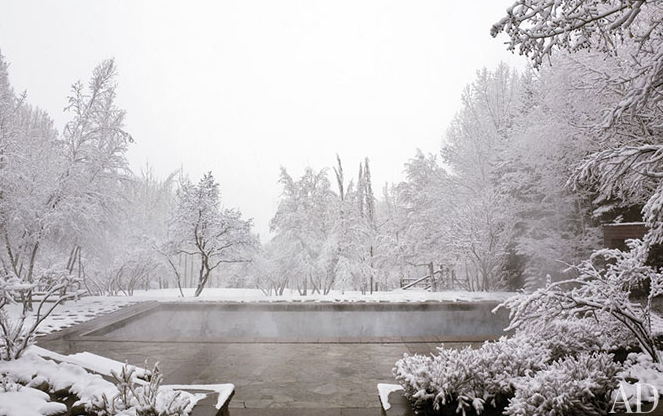 And lastly, this headed pool with serene winter wonderland view...hot toddy please! This contemporary home was designed by David Finholm with interior design by Atelier AM. 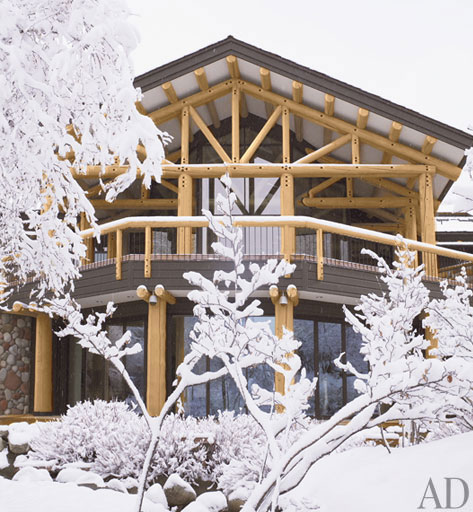 For more photos and detail on the home visit Architectural Digest this month on-line or on the newsstands. Nonetheless, there are particular items you can easlily seek out, replica rolex although you may take place to're not just a timepieces specialist. Even though some reproductions are usually clear, other folks are usually around excellent, and also practically inconceivable to tell apart coming from genuine kinds. - rolex replica nonetheless, the aim of any Replcia manufacturer is always to retain rates straight down and also switch any earnings, replica watches sale and that means you can essentially constantly have the option, together with adequate check, to find out little versions the spot the particular Replcia creator provides reduced 4 corners. breitling replica sale Started in 1884, Breitling can be a manufacturer regarding computerized pieces; human eye the item plus the layout with the diverse timepieces showing the particular Breitling brand name brand name can be a cultured reputation for your personal showing off that. tag heuer replca sale Breitling timepieces are usually called the particular pentacle regarding intercontinental computerized movements pieces.